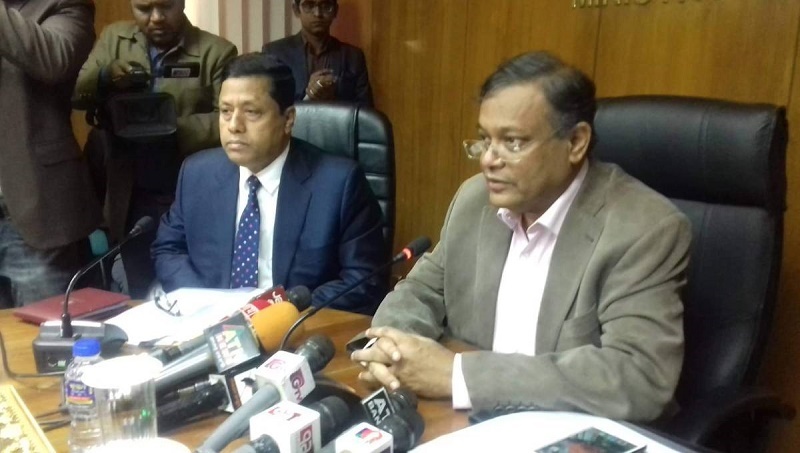 Information Minister Dr Hasan Mahmud on Sunday thanked Dr Kamal Hossain for realising the mistake that Oikya Front had made by incorporating Jamaat-e-Islami in the recent 11th parliamentary election, UNB reports. “I would like to thank Dr Kamal Hossain for realising their political mistake,” said the minister while talking to reporters at the Secretariat. Jatiya Oikya Front chief Dr Kamal Hossain on Saturday said it was his party’s mistake to nominate Jamaat-e-Islami men from Jatiya Oika Front (JOF) to participate in the recently ended national election. Hasan Mahmud further said that the JOF will make another mistake if their elected candidates do not take the oath to join the 11th Parliament. “I hope they will realise it and join the parliament by taking the oath of office,” said the minister. “A party is trying to drag the country backwards. I think no conspiracy against the country will work,” he said. Responding to a question about the recently enacted Digital Security Act, he said that the government will work so that no panic remains among the journalist about the act. “I always welcome all types of criticism. When I was the Environment Minister, English daily the Daily Star published several reports criticising the ministry, even they published cartoons. But, we gave them an environment award. Bangladesh Paribesh Andolon (BAPA) was also awarded although they had criticised the ministry,” said the minister. “This time, Awami League has pledged that the country’s villages will be turned into cities. Coordinated efforts are required to move the country forward. Mass media also play a vital role in this effort,” said Hasan Mahmud. The minister also said that a huge revolution has been made not only in the country’s online media but also in print, electronic and social media. “Around 8 crore people are using social media,” he mentioned.